A simple offset multi in this pretty little Buckinghamshire village. The Village Signs series (VS for short) is a series of caches based on the ornate signs that depict the heritage, history and culture of the villages that put them up. The cache is not at the published coordinates, but is a short walk away. Cublington is a small village, situated to the north of Aylesbury Vale. The village website promotes it as 'The Village that Moved', referring to the period before 1400 when the old village was abandoned and the entire village was moved to its current site. The old village earthworks are still visible today along Ridings Way. 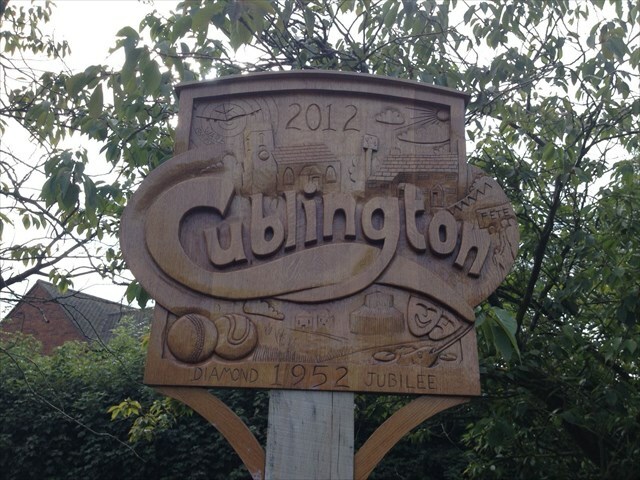 Cublington became the focus of the nation's media in 1969 when the Roskill Commission recommended that the entire village should be bulldozed to make way for London's third airport. The new airport would have covered the land occupied by three local villages and would have been three times the size of Heathrow. Ultimately however the 'Wings off Wing' campaign was successful and the recommendation was rejected by the government. Today the village has a thriving community and not less than thirteen buildings in the village, including the parish chuch of St Nicholas, are Grade II listed. Find a bench overlooking the village sign dedicated to the memory of Edward Brazier. The dates he was alive were 19AB-19CD, and he was a resident of the village for EF years.